There I was, standing next to the Palestinian man when I said “Thank God I’m not like you.” But it felt wrong and degrading. While it was a part of the traditional Aleinu I had been saying for years, I had spent all day with this man and others, along with my fellow HUC students (back in 2004), trying to build bridges of understanding between our two peoples. After a day of discussing and debating, and most importantly, just hanging out, we invited this group of interested but reserved Palestinians to join us in maariv (our evening prayer service). The fact that many of them understood Hebrew gave me a new perspective when going through our prayers, especially when we got to Aleinu. I’ve always had trouble with the traditional words of Aleinu. And a look at Mishkan T’filah, with the 3 other alternatives, suggests I’m not the only one. It was written in a time when one of the few ways Jews could fight back against persecution and discrimination was liturgically. It helped us to feel better about our lot by thanking God for not making us like them. But times are different now. We are one of the most successful minorities on the planet. And while there are still trouble spots and incidents, the perspective and tone of the traditional Aleinu, even before it was acutely raised in my consciousness during services following our mock “peace talks”, troubled me. After all, there are a number of examples of Reform liturgists crafting or re-writing prayers to maintain their basic structure and context, but to reshape their phrasing. For example, in nissim b’chol yom, we no longer say “Thank you for not making me a slave” but “Thank you for making me free.” We no longer say “Thank you for not making me a woman” but “Thank you for making me a man/woman.” They are positive reframing of negative statements. Certainly the Aleinu could take this same approach: thank God for who we are as Jews, rather than for not being like everyone else. The trouble with the existing alternative Aleinus was they were fairly awkward to say. We instinctively wanted to use the traditional chanted melody (i.e. Sulzer), but the words didn’t quite fit. Plus, there were times when the community was saying the traditional version, and I wanted to say an alternative, and the auditory dissonance was too much for me. So, I set about writing a new alternative, which both fit to the traditional melody and proclaimed my thanks for our unique role in the world. As I see it, two of the most important roles Jews play are: (1) as stewards and guardians of the Earth, as seen in the Garden of Eden and the midrash which has God giving Adam a tour of the whole world and ends with “take care of the Earth, for if it is destroyed, there is no one after you to repair it.” And (2) as messengers of the teachings and morals of Torah to the world. Additionally, while we are a unique people, the reality is that our destiny is intertwined with the other peoples of the world. For example, global climate change doesn’t just effect some people; it effects all of us. We live scattered around the world, our lives intertwined with others. And so, when the editors of the new machzor, Mishkan HaNefesh, wanted to include my alternative Aleinu, paired with a new translation by Rabbi Shelly Marder, I was both honored and humbled. Symbolically it is very powerful, since Aleinu as a prayer began in High Holy Day liturgy, and from there made its way into the daily service. To have my Aleinu be a part of something so powerful and reflective of the current state of Jewish life, is such a blessing. In this new machzor there is truly something for everyone, and I pray that my alternative Aleinu can be that something for many Jews, for years to come. Rabbi Dan Medwin is the Publishing Technology Manager at CCAR. I stopped saying “ve lo asanoo..ve lo samanoo” more than 50 years ago at Camp Ramah, at about the same time as my counselor, Martha Ackelsberg, also pointed out the problem of “ve lo raiti tzaddik neezav” in the Birkat ha-mazon (have always said “loo-lei raiti” since then). Would like to see your alternative Aleynu rendering. I’ve always preferred just humming over the words rather than changing the language. But I’m willing to be convinced! Thanks for your comment! We’ve inserted the text within the blog post. I’d love to hear what you think. Thank you for this essay, Dan! I stopped saying the traditional Aleinu when I entered HUC in LA in 1968. I cannot count the number of times that I have stood in silence while others sang it. I have never used it in services that I have led. The Union Prayer Book did away with it for the reasons it troubled you. It came back in Gates of Prayer with—thankfully— alternatives (and the one that I loved and still love is “sheh hoo sahm chelkeinu l’ya-hade et shmo v’goralenu l’hamleech malchuto” understanding the melech as “Ruler” not the masculine “King”). Gates of Repentance also— thankfully—has alternatives. Kudos to you for coming up with one that meets your needs and those of many of us, philosophically, politically, liturgically and musically. Yishar Kochecha! In my opinion, this is the best alternative to the traditional Aleinu that I have seen. It allows for our special role in the world as “slichei haTorah” (a phrase I’ve not seen before) without denigrating our fellow human beings who are not Jews. Mazal Tov! Yes! I’ve never seen that term either, but is so articulate, concise and right on for the connection and mission of Jews and Torah! I commend Dan for his reformulation of the traditional Aleinu. I’ve always considered it exclusivist, offensive, and even racist. Like Stephen Fuchs, in all synagogues where it is used, I stand silent until the “Va-anachnu.” I have always been disturbed that the traditional Aleinu has ever been published in a Reform liturgy. It is an blatant example of “Mindless Traditionalism.” I vividly remember attending a Bat Mitzvah in a synagogue in another city. The mother of the celebrant was a Jew-by-choice. Her non-Jewish parents were invited to open the Ark for the Aleinu. Having them stand there while the congregation was affirming that they were happy that they weren’t Gentiles demonstrated the problem so vividly. Thank you, Samuel. I think one of the key struggles of Judaism is balancing tradition with adapting to modern life. Hi Dan. The question we may want to ask ourselves is this: Is there a difference between being Jewish and not being Jewish? And if there is, do you think it is better to be Jewish, for you? If you do, then by changing the words of the Aleinu, are you merely keeping your feelings secret? I think that we should be allowed to say that we are glad to be Jews. I would remind Rabbi Stahl, who feels this statement is racist, that anyone can be a Jew, and then can joyfully recite the Aleinu with his or her congregation. Is there a difference between saying “I’m proud to be a Jew” and “I’m glad I’m not a non-Jew”? Although I’m late to this conversation, I’d suggest that while we may not think of these words as “racist,” they are elitist; they imply that WE are not like people of the earth/dirt, that our praises and standing before the King of Kings is better than others; that in the totality of Heavens and Earth, created by the Holy One, baruch hu, this particular lineage of people stands above others in our mission to serve. 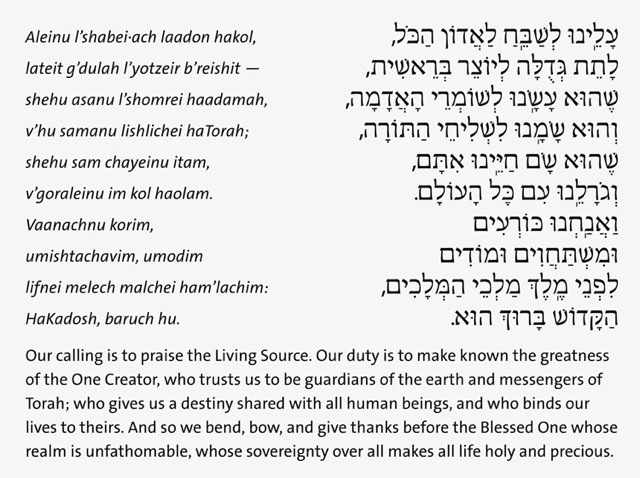 Rabbi Dan’s re-Smithing of these words no longer makes our destiny separate and better than others, but rather alongside, with a mission to care for the earth and to work in our path of Torah with other peoples, who also have holy relationships with The Creator of All. I’m a fan of this iteration! Thank you! I am glad to see this liturgical conundrum is finally being addressed. I do have 2 questions or points. 1. Though the Hebrew fits with the traditional Aleinu melody, the text is a bit if a tongue twister for the average congregant. I would think that the end game should be to have an Aleinu devoid of particularism be our usual text and not an alternative. Truth be told, most of the alternative prayers in our prayer books are rarely if ever utilized. I belong to a reconstructionist shul and as you may be aware, the reconstructionist prayerbook has changed the text of the Aleinu. This changed Aleinu text is the main text we use and the traditional Aleinu is the alternative text. (We never use it). The text of the “reformed” or “reconstructed” Aleinu is short, simple, and familiar to congregants as it borrows from the 2nd blessing after the reading of the Torah. This has helped to make it the “traditional” Aleinu done in most reconstructionist synagogues, I applaud your initiative with reworking the Aleinu. It is long overdue in the reform prayerbook. I hope that further discussion and creativity will lead to a standard Aleinu prayer that will be used in all congregations. Question 2 quickly; Have you had any feedback from rabbis about if they will use the alternative or even mention that it is there? Do you or any other colleagues have an action plan to introduce it into services or how congregants will be educated so that they can learn about the prayer and the values it espouses? That,I believe is the key for any new liturgical change to take hold in our congregations. Thanks for your comment, David. Yes, a number of Reform rabbis have told me about their use of this alternative during services, some of whom even took the opportunity to teach about the Aleinu and its history during their sermon. I am especially appreciative to Rabbi Medwin for his contribution to the seemingly endless debate over the wording of the Aleinu. Rabbi Medwin’s new rendition certainly evokes the highest values of Reform Judaism. Whether it will ever be adopted by the congregations of the URJ is uncertain. I wish him and his interpretation well. However, what his essay and the ensuing comments fail to deal with is “the elephant in the room,” namely that the vast majority of participants in Reform worship habitually join in the chanting of the historic Aleinu, and they have almost no idea of what the song/chant conveys. This is not only an issue as related to the Aleinu; it touches on what I regard as one of the most significant problems of contemporary Reform worship. With the widespread trend toward more and more participatory Hebrew, there is less and less awareness of what these prayers actually mean. When we say: “May the words of my mouth and the meditations of my heart be acceptable to You…,” I believe this infers that we should comprehend what we are saying/singing/chanting. And if we do not, then can it be said that such words/songs actually constitute prayers at all? Rationality remains a guiding principle of Reform Judaism. This applies to our worship experiences just as much as to the way in which we deal with the great ethical and social issues our times. Without understanding, the Aleinu, like so many other prayers in our siddur and machzor, are mostly mantras, endowed with kavanah perhaps, but without comprehension.